Get ready to show your school spirit! 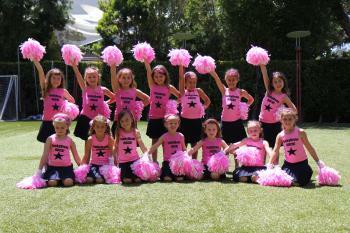 This is a combination cheerleading and dance class for those that want to learn new cheers, sideline dance routines, arm techniques, jumps, pom routines, and meet new friends. You’ll even learn some stunting! You’ll make megaphones and school spirit posters to help you cheer on the Village Vikings! On the last day of class, a performance in costume will be held for family and friends to see your new moves. GO VIKINGS! Pom Poms included with registration.